I’m doing a five-week workshop on shibori, and have finally gotten caught up to the current lesson, which is on stitched shibori.Â So far all I’ve done is mokume shibori, which is parallel lines of stitching.Â Why so much time on one technique?Â Because all woven shibori is variants on mokume shibori!Â So doing a small number of exercises in hand-stitched mokume shibori will teach me the principles of woven shibori.Â Â Then I can take those concepts back to the loom and work on bigger pieces in woven shibori, confident in my designs. Long stitches, spaced identically. The fabric is pulled up into parallel (and quite boring) pleats; furthermore, the compression is so good that very little dye gets into the fabric. mokume shibori - long stitches, spaced in parallel rows 1" apart and staggered so the stitches lie precisely opposite each other. Notice the complex texturing and the diagonal lines! 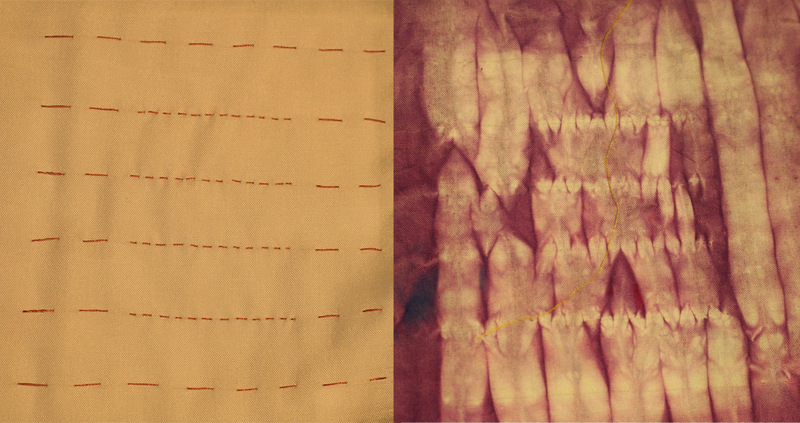 mokume shibori - long stitches (outer rectangle) vs. short stitches (inner rectangle). 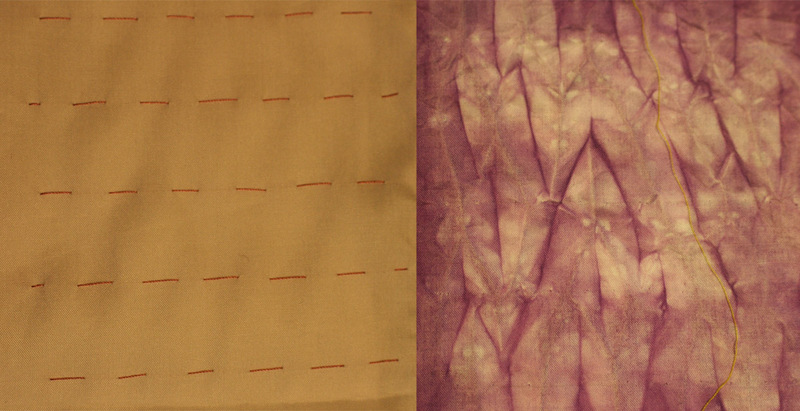 mokume shibori heart - long stitches on outside, floats on outside heart, small stitches in inner heart. I’ve learned a tremendous amount about how woven shibori works just from these few exercises, and will continue stitching samplers until I understand the principles of mokume shibori a little better.Â Then it will be back to the loom! Meanwhile, Kodachrome is completed except for the snaps (which need to be sewn down firmly) and the lining, which needs to be re-hemmed.Â For some reason, the lining is too short near the center back, so I’ll need to redo the hem, dropping it by about 3/4″.Â Fortunately I have enough length that I can do this!Â After that, all that will be left is sewing in the label. wonderful results and thanks so much for the great explanations. Your samples are beautiful Tien and I love all of the before and after pics. Great to see how you achieved the different effect. I intend to do some dyeing tomorrow, so will be stitching tonight!